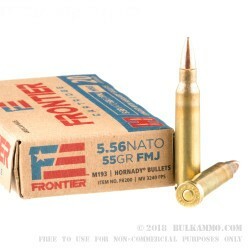 This bulk case of 5.56x45 ammo by Hornady Frontier is perfect for an extended stay at the shooting range. 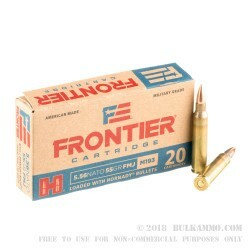 Hornady released their Frontier line as a collaboration with the Lake City Army Ammunition Plant. 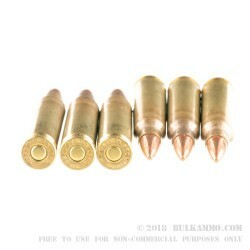 These 5.56x45mm cartridges feature Lake City brass casings and 115 grain full metal jacket (FMJ) M193 Hornady bullets that exit the muzzle at 3240 fps. 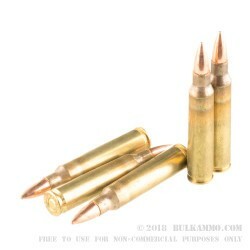 The components used in this ammo are military grade and extremely consistent; you won't want to shoot anything else in your AR-15 while on the range. Shooters who enjoy handloading their spent casings will appreciate the new-production, Boxer-primed brass casings. The high-quality brass is non-corrosive and able to withstand extended periods in dry storage, so you don't have to worry about ordering such a large quantity. If you're new to Hornady ammunition, their newest offering is a great place to start. Order your 500-round bulk case today!